Are you overweight, out of shape and perhaps even depressed about the fact that you can’t seem to get rid of the unwanted fat that seem virtually impossible to burn off? Have you tried every single diet, exercise program or weight loss product known to man only to wind up right back where to square one or even worse off than when you started? Are you just about ready to throw in the towel entirely and just accept the fact that you were never meant to have that beach body that you see in magazines or on TV? If you answered yes to anyone of those questions, then you have arrived at the right place. 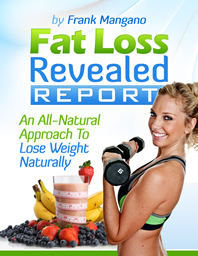 How To Re-Program your Mind and Body To Lose Weight Automatically and keep it off Permanently.....Guaranteed! A Scientific Secret that will Show You How To Lose Weight Automatically, Improve Your Health Automatically, have Unlimited Energy and Motivation every day and much more! The Secret To Paving The Way To Creating A New Thinner "YOU." My name is Dr. Steve G. Jones, Ed.D., Clinical Hypnotherapist and helping people creating positive lasting change in their lives is something I have dedicated most of my life to. For the past two and a half decades, I have been helping people improve their lives by using the power of hypnotic influence to reprogram their subconscious mind (which ultimately controls everything we do) to help them think and act in a way that is conducive to achieving the goals that they will enrich their lives. Without question, weight loss and achieving optimal health are two areas of life that many people seem to struggle with; especially the losing weight part. The simple fact is that most people do not enjoy being overweight. Aside from the toll it takes on your health, it virtually tears your soul apart because you are constantly living in a state of unhappiness (and for lack of a better term) un-naturalness. So what do I mean by that? Well, simply put, human beings are not “supposed” to be overweight because that is not how our bodies should appear in their natural state. Think about the cave man era. In those days, we did not see overweight people. Why? Because man was not consuming processed foods, eating more food than his body actually needed or ingesting harmful “potions” that claim to make people healthier. Instead, people of that time were eating natural foods and getting plenty of exercise. Centuries later, we have grown to become a “quick fix” society. Remote controls save us from having to get up to change the channel. Cars make it less likely for us to walk to the local grocery store. And that’s just scratching the surface in terms of advances in technology. Nowadays, there’s a pill for everything ranging from how to lower your blood pressure to how to get an erection. While these advances in science and technology certainly are interesting and in some cases, have improved the quality of people’s lives, the reality is that much of it is causing us to self destruct because we are moving further and further away from our natural states of existence. In today’s world, to get even a fraction of the exercise that people did in primitive times, we have to actually set aside a block of time to visit a facility where we can run on a treadmill. In others words, where as years ago, people were physically active for most of the day and rested for just a little time, today we rest for most of the day and set aside an hour or so for exercise. And that’s assuming you actually do exercise. It’s no wonder that losing weight remains a consistent problem for so many people. And why regardless of all the great advances in technology and science and all of the so called “miracle discoveries” that obesity levels are at an all time high. And further more why even with people being more knowledgeable than ever about the benefits of exercise and food choices, this epidemic still exists. And what’s really alarming is the fact that the very thing that we are relying on to save us (advances in technology and science) is actually what’s hurting us even more. Whether you choose to believe it or not, nearly every single product aimed at losing weight without diet and exercise is simply pure nonsense. It was something created with the intent to mislead the public into believing they can lose weight the “easy” way with the sole purpose of generating fast profits and making the manufacturer filthy rich. And every single diet that involves food changes for just a short period of time, is just a waste of time because the minute you resume your “normal” eating habits, the weight comes right back. I’ve said it before and I’ll say it again…….. If such a “magical formula” really existed, why is it that people still aren’t shedding unwanted pounds and body fat? The answer is plain and easy to see, it’s because there is no such thing….period end of statement! Now I’ve been exercising regularly and eating pretty well for most of my life and I’d like to think I’m in pretty good shape. I’ve never had an issue with my weight or my health simply because I know what works, I put it into action and I see the results. And the truth of the matter is, so do most people. If you ask a hundred people what they key to optimal health and a great body is, I’m wiling to bet that at least 95 of them would say a health diet and regular exercise. In other words, most people in today’s world know what works. So again I ask, why are obesity levels at an all time high and why the heck are people still flushing their hard earned money down the toilet by choosing to the believe there is some miracle diet or pill that will do the work for them? The answer is simple; it’s because most humans prefer the path of least resistance. Most people would rather subscribe to the dream that such a fantasy-like answer really exists and that they could leverage its powers by using it rather than doing what they really know in their hearts will work because it’s been proven to do so for hundreds of years. Knowing that exercise and a healthy diet are the key is obvious and easy, it‘s actually doing it that’s difficult. Now again, I realize that we live in a world today that is centered on finding faster, easier and more effective ways to do things. And until the end of time, even people who may not necessarily prefer the path of least resistance are going to want to find faster, easier and more effective ways to achieve results; especially when it comes to losing weight. And that’s why you have arrived at this website in the first place right? I mean obviously you didn’t come here and read all of this because you want purchase a tv or learn how to speak another language right? You came here to find out how you can lose weight and get in shape, faster, easier and more effectively. And that’s exactly what you’re going to learn to do. So let’s get right down to it. Now that we know that access to the effective information isn’t the problem, rather it’s putting it into action that remains the challenge for most people, we can agree that an effective weight loss system is only as good as it’s ability to motivate people to take action. Good, because the first step in overcoming any obstacle is knowing what that obstacle is. So how exactly does that happen? What is the key to long term motivation and getting people to take action? Is it getting people even more informed so they can see the benefits and risks associated with the actions that they take? Well, that’s part of it but that alone won’t do the trick. If it did, people wouldn’t still be smoking cigarettes or doing drugs. Is the answer to lock people away in camps where they have no choice but to eat right and exercise? That may work as well but what happens when the person comes home and has to resume their normal life again? If that worked 100 percent of the time, we wouldn’t see people returning to rehab centers over and over again. Let me tell you what 25 years of experience, research, education and working with people has taught me……. The only way to create any sort of lasting change in anyone is to change the way they think on a subconscious level so they can then think and behave in way that that will yield a certain result. This applies to both positive and negative change. If a person continues to smoke when they consciously know it’s not healthy for them, it’s because subconsciously they have a belief that counters the conscious belief. Perhaps subconsciously they feel that the rules don’t apply to them or that the feeling they experience when smoking is more rewarding than stopping. Whatever the belief is, when it exists on a subconscious level, it will always dominate your actions and therefore impact your results. So they key is to implant messages in the subconscious that bring forth positive results rather than negative. When you do that, the person begins to act in a way that will create positive results in their life. But There’s A Missing Link That Even The Most Skilled Psychologists, Hypnotherapists And Experts In Psychology Don’t Seem To Identify………. I call this missing link the Subconscious Redirect. Basically, the subconscious redirect occurs when there is a shift in the subconscious belief system which results in a change of actions. A subconscious redirect is the reason why people who have been subconsciously programmed to quit smoking go back and begin smoking again. Or how a person who begins eating healthy and exercising falls off track and goes back to living an unhealthy lifestyle. What usually happens is a stimulus of some sort changes the way the person thinks subconsciously and they begin to adopt a different belief which then brings causes them to return to their negative behaviors. This is a good part of the reason why so many people continue to fail when it comes to losing weight. Combine that with the fact that the products or systems that they are being tricked into believing work actually can’t provide any benefit whatsoever and what you have on your hands is a vicious cycle of obesity that just keeps getting bigger and bigger. So what’s the remedy to this issue? That’s the question that I have been asking myself for as far back as I can remember. And the answer that I have arrived at is simple, yet immensely powerful; it’s called our habits. A habit (by definition) is an acquired pattern of behavior that often occurs automatically. And usually those two attributes have a compounding effect on one another; meaning the more you develop a pattern, the more automatic a behavior becomes and the more automatic, the stronger the pattern is. Again, this applies to both positive and negative habits. Habits ultimately shape our life. Our reality first takes shape within our subconscious mind through visualization, imagination and our overall thought process but our the result of our reality really depends on what actions we take and what behaviors we exhibit. For example, if you visualize yourself losing 50 pounds but are in the habit of eating fast food and not exercising, you will not lose that weight no matter how hard you envision it happening. This is where most people come to me for help because using my craft, I can help program the subconscious mind to help people develop behaviors that will supporter their goals. The challenge for me is the habitual aspect of it all. You see, whereas I’m confident in my ability to hypnotize anyone, I simply cannot hypnotize the same person all of the time. And if they do not remain focused, they can ultimately have a subconscious redirect and wind up developing negative habits all over again. This is especially true when it comes to weight loss, especially since billions of dollars are being spent every years on advertising campaigns designed to subconsciously influence the consumer to purchase foods or products that simply won’t help them lose weight. Realizing the only true remedy this challenge is to begin focusing on the habits that people develop and how to influence them to form and retain positive ones; I knew I needed help from an outside source. I knew I needed to find someone who’s not only uniquely qualified to help people develop positive habits but also has a proven track record of doing so. Well, when it comes personal development through positive habits, there simply is no person more qualified in my opinion to help people, then Dan Robey. Dan Robey is the author of the Best-Selling book "The Power of Positive Habits" which is published in 22 countries worldwide. He is also the co-author of a new book with Zig Ziglar, Brian Tracy, Dennis Waitley and other leading Self-Help experts titled "101 Great Ways to Improve Your Life." The Power of Positive Habits program is the result of years of medical and scientific research including interviews with top health and success experts around the world. Dan is a noted authority on habits. He has written dozens of articles on habits which have been published in national magazines such as "Prevention", "The New York Times" and others. In the past few years Dan has appeared on 100's of radio interviews teaching people how to change their lives via the acquisition of positive habits. His weekly internet newsletter on positive habits and other strategies for personal success reaches over 35,000 people worldwide. Today, Dan continues his mission to help 1,000's of people around the world achieve personal success, improve their health and increase their longevity by learning the many benefits of positive habits. And that’s why I don’t believe I could have chosen a more qualified person to collaborate with when creating this program. Listen in on this exclusive interview as Dr. Steve G. Jones, Ed.D. and Dan Robey discuss strategies and techniques that will have you loving what you see in the mirror in no time! The Power Of Habit Acquisition – Here, Dan will introduce you to the nuts and bolts that hold his entire program together where you are creating an environment in your mind and body where weight loss becomes 2nd nature and automatic. Actionizing — Here Dan will show you the exact science behind transforming new found knowledge into action. Acquiring a Habit — Discover how easy the process of acquiring a positive habit truly is in this module. Habit Acquisition Stage One — Here Dan will show you how to reach and identify the exact point at which your new habit will come to life. Foundational Habits — Here you’ll discover the habits that will serve as pillars for supporting all of your other habits that support all your other hypnotic weight loss habits. Habit Triggers — Here you’ll learn how to use external stimuli to help trigger a habit to activate your hypnotics habits for weight loss. Habit Combinations — Learn the secret to combining hypnotic habits for weight loss and start increasing your benefits exponentially. 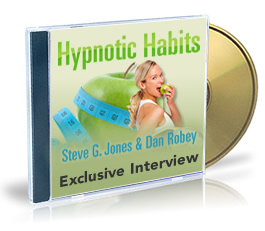 Hypnotic Habits For Weight Loss In A Minute - Here Dan will show you how to create positive lasting health habits in just one minute that will last you a life time. The Foundational Step – Learn the first essential step in building hypnotic habits. This is the same step that Arnold Schwarzenegger used to become the star of a Blockbuster movie with no acting experience at all. One Minute Tracking – Here you’ll learn a simple but powerful hypnotic habit that will allow you to quickly track your daily progress toward reaching your destination of a trim and fit body. Benefits Of one Minute Tracking – Discover all of the benefits of one minute tracking and the profound effect it will have on your journey toward a new trimmer you. One Minute Progress Tracking – Here Dan will show you a simple way to track all of your progress in less than one minute so you never lose focus on your over all goal. How to Get Trim and Fit Automatically! – Here you’ll discover secrets that will increase your metabolism and help you burn more calories automatically. Quick Fit Tips – Here Dan shares some of the most effective yet simple things you can each day to reduce caloric intake instantly. Hypno Habit One – Learn one small secret that makes eating salads effective instead of a complete waste of calories. Hypno Habit Two – Here you’ll learn a habit about burgers that will help improve breast, colon, and prostate health all while reducing menstrual disturbances and building stronger bones. Hypno Habit Six – With this habit you’ll be able to enjoy something creamy and delicious that was proven to help women who consumed it three times daily lose 70% more body fat then women who consumed less than one serving. Hypno Habit Nine – Discover an extremely tasty food that is packed with antioxidant power and has been proven to reduce the risk of many types of cancer. 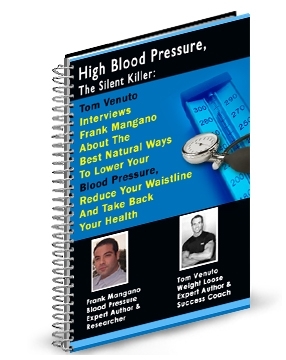 Hypno Habit Twelve – This habit will almost instantly reduce the bad form of cholesterol in your body. Hypno Habit Seventeen – Here you’ll learn how to satisfy those snacking urges throughout the day with something that will not only strengthen your heart but help boost your metabolism and actually help you burn more fat. Hypno Habit Eighteen – This habit will not only motivate you but it will even get your pet in shape. Hypno Habit Twenty One – Developing this one habit will help you burn about 200 calories in a 5 day work week, which is about 10 pounds during the course of a year. Hypno Habit Twenty Five – This one small step will keep you on track even when you are eating out and save you 10 to 30 grams of fat and 100 to 300 calories per entree. Hypno Habit Twenty Six – Developing this habit will help you eliminate an average of 1,960 calories per week and over 100,000 calories per year all while satisfying your thirst. Hypno Habit Thirty – According to one research scientist from the University of California, you can drastically reduce your chances of heart disease by changing this one aspect of your life that that has nothing to do with diet or exercise. 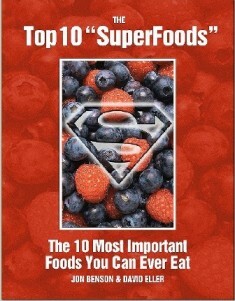 Supplementation Habit One – Here you’ll learn the essential secret to reaping the rewards of supplementation. Supplementation Habit Two – According to the Journal of the American Medical Association, you can now reduce your chances of getting chronic diseases, like cancer, cardiovascular disease and osteoporosis by implementing this form of supplementation into your diet. Supplementation Habit Three – By adding this supplement to your regimen, you can produce more energy safely and naturally. Supplementation Habit Four – The benefits of what you will discover here include improved breast, colon, and prostate health; reduced menstrual disturbances, and stronger bones all while helping you lose weight by reducing your fat intake, calories and cholesterol and improving your energy levels. Supplementation Habit Five – Adding this tasty treat to your regimen will provide such benefits as helping to control and normalize body weight, helping to improve digestion, removing toxins from your body, helping to relieve muscle stiffness all while keeping skin, tissues and joints youthful. Hypnosis Overview – Here you will learn exactly how to use hypnosis for weight loss and why it’s more powerful than anything you’ve ever tried before. Five Pillar Hypnosis – Here Steve will introduce you to the five parts of a hypnotherapy session so you can understand the role that each step plays. Information Application – Here you’ll earn how to apply the practical knowledge that you will discover in the bonus recordings that will be provided. Phase Two Self Hypnosis – After phase one, you will now be exposed to detailed information about how to induce a hypnotic state in yourself. Achieving The Alpha State – Here Steve will show you how to deepen your hypnotic state and operate on a subconscious level. Weight Loss Programming – Once you’ve achieved the alpha state, you will then learn to hypnotically program your mind to achieve weight loss. Overcoming Hypnosis Obstacles – Her Steve will show you how to stop working against yourself by using something called hypnotic amnesia. Closing Out – Here you’ll learn the exact steps to successfully end your powerful weight loss self-hypnosis session. The Power Of The SWOT – Discover the key to identifying and leveraging you Strengths, Weaknesses, Opportunities, and Threats. Enhancing The Vision – Here Steve will share a special technique that will enable you to get crystal clear on your weight loss goals so nothing will interfere with your focus. The X Technique – using this special technique, Steve will show you how to quickly eliminate negative self-talk. Creative Visualization – Learn how to use visualization for powerful weight loss so that you never lose sight of your goals. Apply The SWOT Analysis - Here you’ll learn how to use this analysis to effectively break through your former barriers. Finding Consistency – Learn how to program yourself for continuous motivation to lose weight so that you don’t slip back into negative habits. Controlling Your Actions - Learn how your environment has been controlling you and how you can get that control back. Continuing The Journey -Learn how to use incentives to keep yourself moving toward weight loss. The Key To Commitment – Here Steve will share a simple yet super-effective technique to ensuring your exercise plan is put in place and never changes. Weight Loss Clarity – Discover the secret o getting very clear on your goal weight. NLP Anchor Installation – Here you’ll learn how to install an NLP anchor for weight loss and motivation and learn why this may be the most powerful technique you will ever use. NLP Anchor Stacking – Here Steve will show you how to stack NLP weight loss anchors so that they become even more powerful. Attracting The Body That You Desire – Learn the techniques that will enable you to use the Law of Attraction to increase your motivation to lose weight. PLUS, you will receive a platinum recording, which Steve specifically designed for this program. Steve took the scripts from some of his most powerful platinum hypnosis recordings, combined them with some specific suggestions to help you succeed in this program, and created this powerful platinum recording for you! Now you will succeed using the power of subconscious programming! How’s that for an in-depth look at what it takes to lose weight and keep it off for good? Well that’s the question that I was faced with when I decided to bring this to the world.....even though in reality, I know that Dan and I could basically name our price for this resource and I guarantee that people would pay it hand over fist no mater what it was. Why wouldn’t they? This is what the world has been waiting for. To do that, Dan and I decided that we have to make this program as easy to own as possible which is why we decided to give the world a unique opportunity to own hypnotic habits for just a fraction of what we know its worth. Let me explain what I mean…. An e-book or digital product from Dan or me usually sells for upwards of $50. 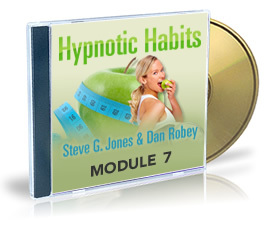 Since you are getting audio modules from the both of us plus an exclusive interview, we could easily sell the Hypnotic Habits program for around a hundred bucks. Combine that with hundreds of dollars worth of bonuses that are being offered and what you have is a bundle of life changing information that is easily valued at $147.00. Special Edition Platinum Version: Power Your Mind To Achieve Weight Loss! Now keep in mind, that even at full price (which are our marketing teams are begging us to sell this for), everyone should own this because it is unlike anything else on the market which alone is reason enough to at least try it and see what makes it different. Well, we decided that even though we could easily charge people $147.00, we would reach even more people if we really created an outstanding value. I mean that’s just human nature. Regardless of how empowering or life changing something is, it always looks better when there’s a great value attached to it. And that’s why you can own the Hypnotic Habits Audio program today to just $47.00. That’s right, for less than what most people pay for one weight loss product that you have to keep buying over and over again like a subscription to a weight loss club or a bottle of pills that will never work anyway, you can own something designed to change you from the inside out. And just in case you think I’m bluffing or have completely underestimated just how powerful this program really is, I’m going to let you try it absolutely risk free. So let me ask you; are you ready? Are you ready to start changing your life and moving in the direction that you’ve always wanted? Are you ready to position yourself to never worry about your weight again? 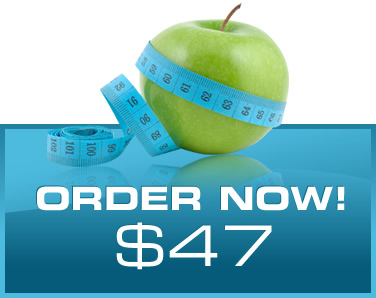 Are you ready to stop wasting time dreaming about that body that could be and instead showing off the new, thinner you? If so, then take action today by owning the Hypnotic Habits Program today! P.S. – Remember, this is the only program you will find created by Dr. Steve G. Jones, Ed.D. 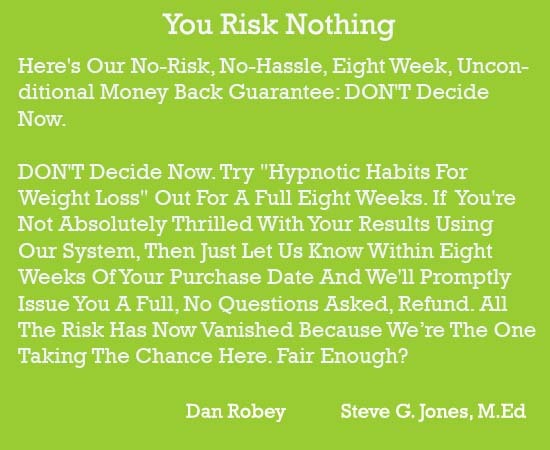 and Dan Robey which combines the power of hypnosis with life changing habits. Own it today and see why they are the best of the best at what they do. P.P.S. – You have nothing to lose except the opportunity to increase your chances of getting the body you’ve always wanted because if you’re not 1000 percent satisfied, we’ll buy the program back from you.